Rose gold rectangular 7AP 21J. Case back has numbers 3022300. Inside case are numbers 4146 RCR and T9/87. Dial has no markings?! Is this oxidation or should it look like this? Any additional info gratefully received. aging could be a factor in the loss of the Dial print, the Case looks very good. Thank you for your help - 1940 President it is then... Can I get the dial refurbed do you know? 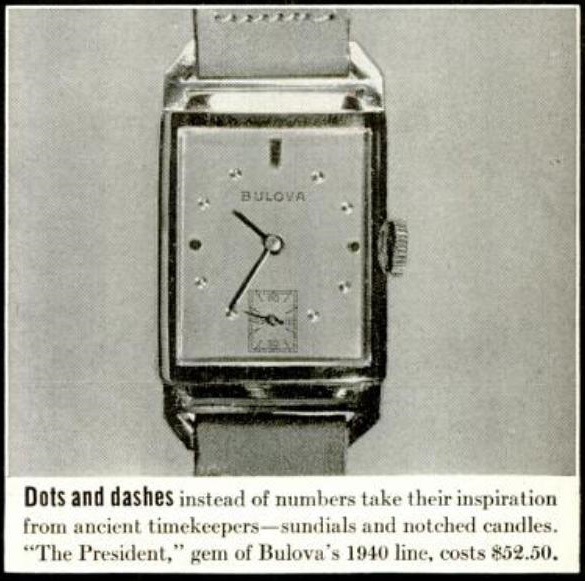 I guess it had the BULOVA name on the dial when new. deasytee, there are dial re finishers out there like "International Dial" who can refinish your dial to "like new" but some purists prefer to leave the dial "as found". Your decision. Good luck. Is there any chance this is a dial variant of the General model? The same Dial is seen in several post 1940 models including but not limited to the 'CONRAD' and the 'BROADCASTER'. Gotta say I'm still chuckling over your toaster!!!!!! I don't think so, I just believe we haven't found the ad yet! When I pulled mine apart, it looked to have never been taken apart and there were no service marks inside the caseback, leading me to believe that this dial was a varient but was mass produced with that dial. Probably has a letter designation that hasn't been discovered yet. In deasytee's first pic it shows $4145 RCR below the description, does anyone know what that means? Pretty sure it doesn't mean dollars?